T-shirts first gained recognition at the end of the 19th century but finally achieved the status of being a trendy item of clothing by the mid-20th century. Because vintage inspired fashion creations continue to trend among today’s women who are die-hard enthusiasts, many of them can express their uniqueness of always being vintage inspired by wearing t-shirts inspired by the vintage era. As we all know, you can wear a t-shirt to look dressed-up, semi-casual, or dressed-down. One that is ornately embellished with ornaments like faux pearls, stones, sequins, and appliques can be worn successfully to dinner events, a party at the Ritz, and such occasions that demand stylish dressing. Semi-casual t-shirts can be worn for an evening out, hanging out with friends, or going to the movies, while casual tees, with or without prints and illustrations are best suited for casual dressing and around-the-house wear. These are the most popular and sought-after for everyday wear. The casual street-style look is the popular style and such dressing is incomplete without a tee. That’s why most women have a good number of these shirts in our wardrobes. Most of us have cause to wear a t-shirt every single day. But how can you get that unique look with a t-shirt? Which type will you wear to make your stand out? The popular ways of expressing preferences for vintage fashion through wearing tees include wearing the ones that have prints of antique or vintage images, illustrations, quotes or photographs. The cuts of tees basically remain similar to the vintage t-shirts worn over half-a-century ago but what majorly differentiates one style from the other is that while traditional ones were plain and at best, sporty, today’s style range from the stylishly cropped to the embellishes tees. If you are one for a stickler for details and wish to have an idea of what illustrates a particular era, this list that covers the years between 1939 and 1990 should be of some help. 1939 to the 40s – The Wizard of Oz and Gone With the Wind. Early examples of vintage t-shirts with printed logos and decorations can be found in the movie The Wizard of Oz. It had the word "OZ" printed on its front. 1950s – Illustrations of resorts and getaways. Some businesses started to decorate t-shirts with holiday resort names and characters. 1960s – The Rock and Roll era. This was a time Ringer t-shirts were a popular trendy fashion among the young rock-n-rollers. It was in the sixties that tie-and-dye and screen printing on tees evolved. The t-shirt became a medium for wearable art, commercial advertising, souvenir marketing, and protest messages. 1970s – Walt Disney characters, Rolling Stones, and Milton Glaser's iconic I ♥ N Y inscription. 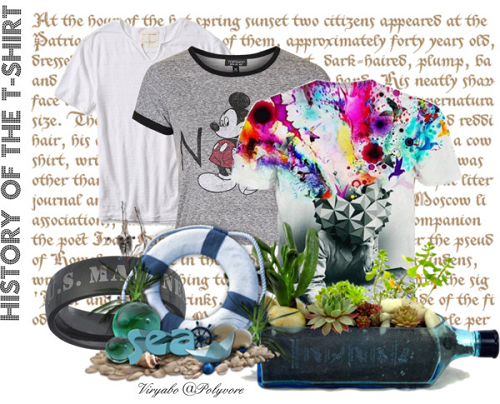 Popular Disney characters began to appear with Mickey Mouse being one of the top choices of prints for t-shirt lovers. Other notable and memorable t-shirts produced during this decade continued to be entrenched in pop culture and were referred to as band t-shirts. 1980s – By the mid-eighties, white tees became very fashionable, especially after Don Johnson wore it with an Armani suit in the movie Miami Vice. 1990s – It became common practice for companies to make t-shirts promotional items as a part of their advertising campaigns. They came with prints of corporate logos, quotes, and messages Also, shirts with prominent designer-name logos like FUBU, The Gap, Calvin Klein and Ralph Lauren become popular with teenagers and young adults. We can’t talk about vintage-inspired t-shirts without mentioning how far the tee wearing culture has evolved. By the beginning of the 21st century, there was renewed popularity in t-shirt wearing and today are worn by all ages from day-old babies to the middle-aged and elderly. They come printed, hand-painted, inscribed, embellished, etc…, and have numerous types of designs on them ranging from quotes and slogans that veer towards the humorous, spiritual, and satirical, to black and white images, hand-painted muddles, studs and stones, photographs, ornaments, and natural elements the shells, corals, and lacquered wood chips. The t-shirt has become one of the most important items of clothing for most people all over the world, most especially because its trend is being embraced by vintage die-hards, celebrities, models, fashion icons, and superstars who wear them either casually in public, or stylishly for top events.